Boys will be boys, at least that is how we used to look at young boys when they got into mischief or were simply having fun. Now, the sight of a young boy playing with a toy pistol is offensive to the social justice warriors. 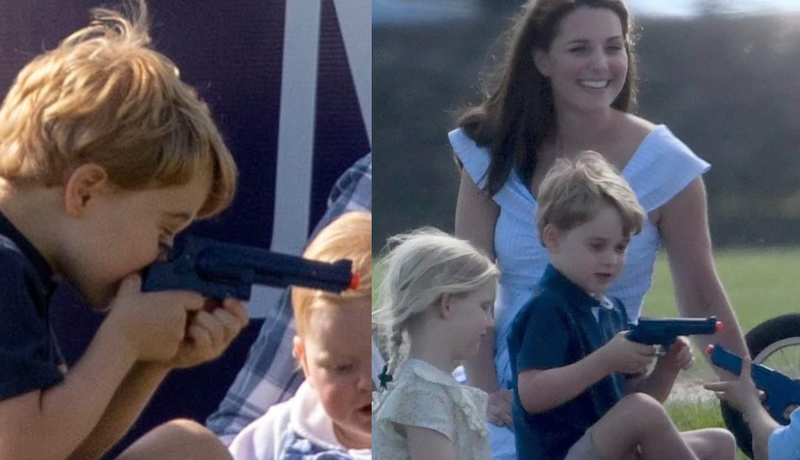 Outrage ensued after a photo emerged of Prince George playing with a toy gun and Princess Charlotte playing in the sun while watching Prince William's polo match. The photographs were taken Sunday afternoon while The Duke of Cambridge played in the Maserati Royal Charity Polo Trophy at Beaufort Polo Club in Tetbury, Gloucestershire. The family outing followed a day after the Queen's official birthday which featured the Trooping the Colour ceremony and was followed by a gathering of royals at the Buckingham Palace balcony. Kate was dressed in a light blue dress and was pictured sitting on the grass with George and Charlotte playing in the grass with their toy pistols. The children all appeared to be more than happy and totally preoccupied with their new toys. Adrina Price said of the photos, "Sad to see George playing with a gun when the whole country has a gun/knife crime situation. ‘Maybe in training for killing wildlife in later years. Thought he was a sensitive child. Better if he was seen playing with a toy car or football. Sadly the Royals will never change." The hypocritical-criticism didn't face the royal family and George is known for wanting to be a police officer when he grows up. Toy guns are not illegal and criticising children simply for behaving like normal little boys is a gross thing to do. One Twitter user tried to compare children who lost their lives for playing with real guns with the royal children's plastic pastime. Guess what all you softies out there, guns are legal, they are how we keep our countries safe, and training children from a young age on how to use them is a parent's choice and theirs alone. If you are criticizing a child for playing with a toy gun then you are more of a problem to safety than he is because you are promoting ignorance and liberal ideology that doesn't believe that citizens need guns. Good thing these ignorant tweets won't even be read by the royal family.